The Prime Minister’s New Clothes | Oh Canadiana! Who doesn’t want to be liked, to be appreciated and celebrated? I wouldn’t mind being feted a little myself. Apparently, fitting in and being cool are our new prime minister’s first priority. Since, October 19th, 2015 I’ve been waiting to see Justin Trudeau stop inserting himself in to the story. To no avail. Justin, it seems, never received the memo that being the leader of the great nation of Canada is NOT a red carpet event. As leader of this country his work, achievements, Canadian lives changed for the better are his legacy. Right now Justin Trudeau is proving that he is desperately out of his depth; unable to move out of the frame and begin the very difficult business of leadership. And as with the fabled Emperor we are supposed to just go along with the charade. As Canada’s economy continues to suffer, while more and more Canadian families struggle to make ends meet we were treated to an article about Justin Trudeau’s fashion choices during his last sojourn abroad. As I read the article describing Trudeau’s ‘ballsy’ decision to doff his suit jacket and roll up his sleeves during one appearance, and his choice of a pair of purple socks emblazoned with neon skulls and crossbones, I shook my head. Was I reading some cutesy little snippet in Chatelaine magazine; trying to get young girls interested in politics? Nope! This was an article put out by non other that the CBC, written by Aaron Wherry with the Parliament Hill Bureau. Congratulations Aaron – you’ve officially rendered yourself irrelevant in your position. If the best you can come up with when the so-called leader of our country returns from an international meeting of the minds is a hollow little blurb about Justin’s socks – go try for a job at Vogue! On second thought I’m not sure you’d be qualified to carry Anna Wintour’s Birkin handbag. So what’s my problem? It all comes down to reputation; ours as Canadians. It would serve Justin well to remember each and every thing he does and says becomes a reflection of us as Canadians. Unlike Bono, Spacey and DiCaprio, who have actual day jobs, Trudeau you work for us! When you go hobnobbing around the world you’re doing it on our dime and your behaviour should be indicative of Canadian values germane to the subject at hand. 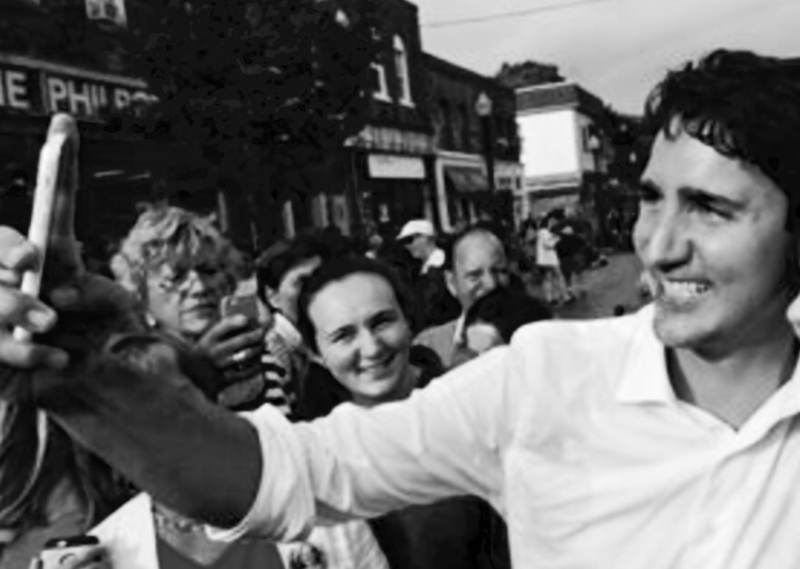 For months now we have been deluged with selfies of Trudeau; ever present starry-eyed grin and arm outstretched in perma-selfiestick mode. Justin looks far more like a tourist or a kid at WEDay than Canada’s prime minister. My tone might be a lot different if things at home were in hand. If industry was chugging along, if immigration reports were being filed on the same schedule as with our previous government, if the cost of living wasn’t beginning to soar as a result of our sagging dollar. I could go on but I’m depressing myself! But right now, Justin, as Shania Twain would say,’You don’t impress me much.’ Just after the election, MacLean’s published an article describing your move into the prime minister’s office mentioning your intention of bringing in an easy chair where you can do some reading. Come again? Let me get this straight – you’re the leader of one of the most complicated countries in the world with a population of 35.5 million people who are counting on you and you are going to do a little cozy reading. You should be spending every waking minute of every single day studying until you can’t even see straight! If you are prove it! Let’s see one picture of you with a book open in front of you. I dare you to actually try and look like a prime minister. To the people, who actually matter, the ones who can actually invest in Canada and stimulate our economy, you and your cabinet are coming across like a candidate on the TV show Dragon’s Den. Don’t think I’m oblivious to how all of this plays for the media party; they are lapping it up. In a land where ‘budgets will balance themselves’ the 42nd Parliament has become the greatest reality TV show in Canadian history. Enter Prince Justin and his Cabinet Court bent on winning a popularity contest with exciting decree after decree; moving ahead without consultation or common sense. At this point you’re either nodding your head in agreement or you think I’m an evil stick in the mud. Hey what’s wrong with selfies, socks and easy chairs?! Right?! On their own absolutely nothing. To reiterate, a point I made earlier I’d be the last person to turn down the Red Carpet lifestyle. Ask yourself when was the last time you saw Ryan Gosling invoke the war measures act? Or the last time you saw Pamela Anderson declare a state of emergency? When a crisis erupts, a nation relies on one person; in the case of Canadians that person is their prime minister. In good times of peace and prosperity protocol serves to root us in tradition; weaving a common thread so that the venerable ebb and flow of pop-culture don’t become our sole reality. An established code of conduct is our touchstone in times of crisis. Here in beautiful Vancouver our maddening windstorms are famous for knocking out power. Suddenly, you’re plunged into darkness but if you’re prepared you’ll have candles or a battery operated light ready to get you through. You don’t need these every day, but they are essential in times of crisis. This is the protocol, and decorum of the Prime Minister’s office, ever present and ready to light our way in times of crisis. So when our prime minister constantly eschews the establishment in favour of the in crowd, when he says ludicrous things to make a self serving impact, his message is pretty clear. Either he really doesn’t care, or, as in the case of the Emperor, he’s too lost in his own story to recognize his own folly. Mr. Trudeau, I implore you please wake up before it’s too late! Posted in 2016 on January 30, 2016 by truenorthsource.